The Yamaha MOTIF is among the most respected keyboards of the current century. 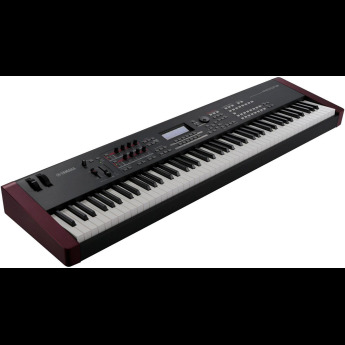 Through its many reincarnations, it has always been among the most revered instruments in professional stage and studio keyboard performance. The Yamaha MOXF8 is the latest iteration of this noble tradition, and stands again as a model of sonic excellence and technical functionality.The soundsYamaha has updated the popular MOX Series with the latest MOTIF XF technology by adding more sounds, more effects and even a Flash board option slot. Because it's compatible with MOTIF XF and MOX data, the MOXF has a huge collection of sound and sample libraries and optional software available right out of the box. Expandable, portable, affordable, and compatible with a wide range of other products, these instruments bring MOTIF music production power to a whole new generation of musicians and producers.The MOXF boasts a rich collection of instrument voices that includes pianos, electric pianos, strings, wind instruments, orchestral sounds, guitars, basses, and drums, as well as a wide variety of vintage and modern synth sounds. Of special note are the detailed digital re-creations of two Yamaha grand pianos (a 9' CFIIIS and a 7' S6) that only an acoustic piano manufacturer could achieve. The finely-detailed reproduction of even very subtle nuances has resulted in exquisitely crafted piano voices that will satisfy even the most demanding players.Now containing a huge total of 741 MB of waveforms, and featuring all-new content, the MOXF offers 136 new voices including the superb S6 grand piano, keyboard sounds such as clavinets and organs, and a range of new sounds from genres as diverse as orchestral and hip-hop. Yamaha's proprietary VCM (Virtual Circuitry Modeling) technology simulates the effects of vintage EQs, compressors, and phasers at the circuit level.This technology has enabled Yamaha to improve the quality of the instruments in the MOXF by modeling the sonic texture of vintage analog compressors, EQs and stomp boxes right down to their component transistors and resistors. 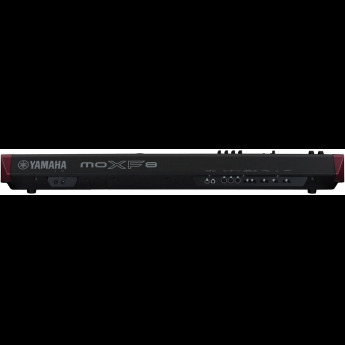 The MOXF also puts the high-quality effects found in Yamaha's industry-standard digital recording consoles at your fingertips, as well as the award-winning REV-X reverb found in the SPX2000. 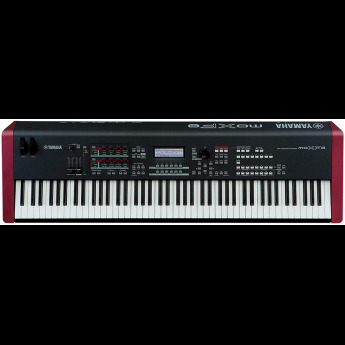 It even comes equipped with vocoder effects, allowing you to connect a microphone to the MOXF's A/D input terminal and apply effects to your voice or create stunning harmonies.SequencerMOXF features a built-in sequencer that lets you produce high-quality music without the need for a computer or any other external devices. This powerful tool offers both real-time recording, which records your performance data as you play it, and step recording, which is suitable for recording precise phrases or other difficult passages. You can even record particularly creative performances directly to a song or pattern simply by pressing the REC button.The instrumentCategory search mode features 16 different instrument categories, each with its own sub-categories, so getting the sound you need is a fast and intuitive process. With Performance Creator you can easily build up layer or split performances with a single button press. Start with a voice you like, and then press LAYER to have the MOXF choose a suitable layer sound. Press SPLIT to call up a left hand bass sound automatically, and then go to DRUM ASSIGN to access the huge variety of built-in rhythm patterns available.The MOXF8 features an 88-key GHS keyboard that provides authentic, realistic keyboard response - much like the playing feel of an acoustic piano - with a heavy touch in the bass register that changes to a lighter one in the treble, and a natural gradation of touch in between.MOXF8: 14.9kg (32.9 lb.) means that carrying the MOXF to rehearsals or gigs is easy. Pound for pound these are the most powerful workstations Yamaha has ever made. Both models are 50% lighter than comparable MOTIF models.